“Long Term Capital Gains on Equities will now be taxed at 10%.” This is the major news that is now making headlines across all media platforms. Thanks to the latest proposal made in Budget 2018-19. So, henceforth an investor of Stocks or Equity mutual funds has to pay 10% as taxes on Long Term Capital Gains (realized). Before discussing on this proposal, lets understand what is LTCG & holding period?? Capital assets are further classified as Financial Assets and Non-Financial Assets. Financial assets are intangible and represent the monetary value of a physical item. Stocks (Shares) and mutual funds are the best examples of Financial Assets. The profit (if any) that you make on your mutual fund or equity investments, when you redeem or sell the MF units is referred to as Capital Gains. It can be a Short Term Capital Gain (STCG) or a Long Term Capital Gain (LTCG) depending upon the ‘Period of Holding’. The tax that is applicable on these profits is known as ‘Capital Gains Tax’. Capital gains on Mutual funds/Equities could be either long term capital gains or short term capital gains, depending on your investment horizon. If you make a gain / profit on your Equity investment that you have held for over 1 year, it will be classified as Long Term Capital Gain. If your holding in an Equity investment is less than 1 year i.e. if you withdraw your units before 1 year, after making a profit, then the profit will be considered as Short Term Capital Gain. As per the existing tax rule, equity investors need not pay any tax on long term capital gains. If investments in equity mutual funds or Stocks are sold within a year, gains will be treated as short term capital gains and taxed at 15 %. The finance minister in his Budget 2018-19, has proposed to tax long term capitals gains of over Rs 1 lakh at 10% without indexation benefit. If an equity share is purchased six months before 31st January, 2018 at Rs 1,000 and the highest price quoted on 31st January, 2018 in respect of this share is Rs 1,200, there will be no tax on the gain of Rs 200, if this share is sold after one year from the date of purchase. However, any gains in excess of Rs 200 earned after 31st Jan 2018 will be taxed at 10%, if this share is sold after 31st March 2018. Kindly note that you pay tax only the extra gain made after 31st Jan, 2018 and only if all such extra gains are above Rs 1 lakh. So, If your LTCG is say Rs 1.25 Lakh and tax of 10% is applicable then you need to pay tax on Rs 25,000 only i.e., Rs 2,500 (up to Rs 1 Lakh, it is tax-free and on the remaining Rs 25,000 gains, 10% tax is applicable). These amendments will take effect on transactions made from 1st April, 2019 and will, accordingly, apply in relation to the assessment year 2019-20 and subsequent assessment years. How are Capital Gains calculated on Investments made before 1st Feb, 2018? Cost of acquisition of this share (purchased before 01-Feb-2018) = Higher of Cost of actual Purchase and FMV. The actual purchase price is Rs 1,000 and FMV as on 31-Jan-2018 was Rs 1,200. So, cost acquisition for LTCG purpose is Rs 1,200. Hence, LTCG = Cost of acquisition – Selling Price. You would (for tax purposes) have realised LTCG of Rs 1,300 minus Rs 1,200 i.e. Rs 100. For shares or equity MF units bought after 31st January, 2018, capital gain would be computed as = Selling price – actual cost of acquisition (without indexation). Here, FMV concept does not come into picture. Any redemption made between 01-Feb-2018 and 31-March-2018, 10% tax rate on LTCG is not applicable. It is a known fact that many of the investors pick Shares or Equity mutual funds to make tax-free long term capital gains. So, this new proposal will surely disappoint them. However, I always believe that investing in a particular financial product based on taxation is not advisable, as tax rules can change anytime. The impact of these changes can be positive or negative for an investor. In one of my very old articles, I have advised, ‘Think beyond TAXES when investing!’, do not invest in a product just because it offers tax-saving feature. Tax-saving is only a value addition. When we invest in Equity securities, we generally do it with an investment objective of ‘long-term’, and because they have a potential to give us decent real-rate of return than many other Asset classes. If you believe that there is no alternative to Stocks or Equity mutual funds for achieving your long-term financial goals, kindly continue with your investments in Equities., even if they are taxable now! Do we have any other better investment option, especially for small and retail investors?? Do you believe that this proposal will have a major negative impact on Indian Equity markets? Will record in-flows to Mutual Funds stop or reduce due to 10% tax on LTCG? Kindly share your views, cheers! this is a good blog explaining various aspect on this topic.I would like to know- can LTCG on debt fund without indexation be added into income from other sources and tax paid as per IT slab. (like STCG on debt). and if it is below taxable limit (rs300000 for sr.ctzn).no tax be paid on such LTCG. Taxes on LTCG on Debt funds can not be disclosed under the head ‘Income from other sources’. It has to be done under ‘Capital Gains’ section of ITR only. LTCG can be adjusted against basic exemption limit only after adjusting all other income. Any investment made u/s 80C or any other deduction under Chapter VI-A (various sections) cannot be adjusted against LTCG. After doing this, if taxable income is Nil then no tax is payable. I want to invest in Equity oriented large cap funds from 2018 onwards for the next 5 years through SIP route. I will be holding the investements and not selling or reedeming and amount. As per new budget rules do I need to pay income tax on these investements for the next five yeras? As per existing tax rule, long term capital gains (if any) on redemption of Equity fund units are chargeable to tax. I have invested in September 2014 – Mutual Fund – Axis Hybrid Fund – Series 15 (1275 Days) Rs.1,30,000/- & on redemption received Rs.161,000/- in Mar-18. Please confirm whether this LTCG of Rs. 31000/- is taxable or not. If yes @ what rate ? According to the finance minister in his Budget 2018-19, has proposed to tax long term capitals gains of over Rs 1 lakh at 10% without indexation benefit. The mentioned new tax rules is applicable for Equity Mutual Funds/Stocks. The fund Axis Hybrid Fund – Series 15 is a Debt oriented fund. As you have held it for more than 3 years, the gains are LTCG and are taxable at 20% (with indexation). Kindly confirm whether the amount received on redemption from this debt fund is Rs.31000/- is chargeable to tax or not. I received intimation under section 143(1) on 5th june 2018 to pay 1870 . I paid on 13th june using link provided(E PAY TAX) in the pdf attchement sent by cpc. amount got deducted from my account and it is showing in my bank transaction as (to transfer INB OLTAS) REF NO.001328352889 IK00QCQXV4 . BUT i closed my pc immediately after amount deducted as i was in hurry to leave for home. i have not used any challan or received anything from CPC.. wat should i do… please help..
Dear PRASHANT ..Kindly refer to our conversation in FB. I have just started following your posts Today only and Infact covered few on various topics.Your writings are very informative and indeed real decisive. I have a situation related to a fresh ULIP plan started February this year, and I need your opinion on this. I “have fallen into trap”( though it may or may not be , but it is yet another ULIP) of ICICI prudential Elite Super Life . Annual premium = 2 Lakh , SA = 20 Lakhs, PPT = 7 years. I have been told that it is invested on a new fund (Active asset balanced fund) which is less than 1 year old since its inception. Looks highly prospective!!! However, I am deciding to exit this plan from now on only. The thing is , 10% of the money is already lost in charges, so actual investment is around 1.8 lacs. Should I dump it on DC fund to earn a meagre 4% , just to recover my 2 lakhs ( a bit more may be after 5 years) ? The vital question is would it be worth to continue this policy ? Your reason for selecting this plan? Thank you for reply and providing the article . To be honest my plan is wealth creation in long term and basically tried to invest in MF. I have another open ended MF as well and recently started SIP with 10K per month , 5K each in two different funds. What would be your take on this situation – will it be wise to discontinue the ULIP and focus on MF and SIPs ? Because if I have to continue the SIPs which is 1.2 lakh p.a there is no point in the above ULIP. Also I maintain a PPF before I stepped into the equity market. As indicated by you, bulk of the ULIP charges will be levied upfront in the initial few years. Given the transparency, flexibility, returns etc., I prefer to stick to MFs to ULIPs. Though LTCG of 10% is applicable on MFs. Also, give importance to Asset allocation. Sir, can you explain the practical example of calculating DDT (Dividend Distribution Tax) of Equity Oriented Mutual fund.. Means I need to understand My Investment is Rs. 100000 of 10000 units of Rs. 10 each.. And they declare 10% dividend.. Please show the calculation based on the recent budget for FY 2018-19. You may kindly go through this article (How is Dividend Distribution Tax calculated – 10% tax – Budget 2018). As always, you advice is much appreciated. Almost all the debt funds are giving very nominal returns as there is no clear trend (upward/further downward) for interest rate cycle. Ideally Dynamic bond funds are to be held for medium to long-term to get decent returns, but let’s not expect double digit returns from Debt oriented funds. May I know your investment time-frame for this? I had initially kept this for medium term, but as I have funds parked in Debt, was thinking of moving this money to a slightly aggressive fund. If your investment time frame is say around 3 to 5 years and would like to take higher risk, can consider MIP fund (or) Equity Savings fund. 1 – This is a pure equity large-cap oriented fund. It all depends on how much risk you can afford to take. The above mentioned funds are good ones in terms of performance. but it depends on which amc you choose. If I switch money from equity fund to debt fund within the fund house, will this LTCG applicable on equity fund? Also, if I switch fund in my NPS tier II, will it attract STCG/LTCG? Yes, switching between the MF schemes do attract tax implications. As per the PFRDA – the new long-term capital gains tax will have an impact on the Tier II account, also known as a non-pension account, but will not have any impact on Tier-1 account. Kindly go through this article ..
Is this applicable to all the assesse’s ? Individual / companies ? what about the mutual fund or asset management companies ? does this leads to double taxation in the hands of both individual and the Fund manager / AMC ? Double taxation happens in case of Dividend option of schemes. AMCs have to pay 10% on Dividend payouts. Also, the investors have to pay 10% on capital gains (if any). I have 2 ELSS funds, Franklin Tax Shield Growth Direct & Aditya Birla Sun Life Tax Relief ’96 Growth Direct. While in 2017, i invested only in Franklin , ABSL is the recent one which i started. I have been investing in Franklin through SIP (10000 per month) which extends till March 2018. And in ABSL i invested 40000 lumpsum during market correction which happened a week back. on the other hand ABSL gave very good returns for 2017. I understand Franklin performs better than ABSL when there is market is low. (Observed the same when the correction happened). So im thinking, if i invest in Franklin during a bear period and ABSL during bull period will it be good strategy?? so that i can use bull and bear market to advantage. I would like to know your opinion . What strategy you follow ? As you are investing in equity MFs for long-term, the possibility of a scheme performing consistently well is what matters! The returns mentioned above are fantastic! A fund may not be a top performer every year. Personally, I prefer to invest manually say 2 to 4 installments in a FY in ELSS fund(s) based on the market conditions. Coincidentally, I have also been making lump sum investments in Birla tax relief fund for the last few days.. Yes, Birla fund has higher exposure to mid-cap stocks whereas Franklin has higher exposure to large-cap stocks. So, accordingly we should expect returns. I invested 7 Lacs in ICICI Pru Long term plan fund in Aug/Sep’17 and getting negative returns till now. Would it be advisable to stay invested or switch over to a better short term/ultra short debt fund? I am retired from Govt service and this corpus was transferred from one of my Bank FDs on maturity in anticipation of better returns. It is a dynamic bond fund, advisable to hold for medium to long-term. Kindly do not worry about short term volatility. If you can not afford to take risks associated with dynamic bonds then you may pick slightly lower risk profile category like the one you have mentioned Short term / Ultra short term funds. Thanks Shreenath for elaborating and explaining it so well. It’s a detailed and useful information, drafted in simple words. Very timely information. Thanks for the blog. I am senior citizen invested in balanced monthly dividend mutual funds My quiry is dividend distribution tax will be taxed by AMC every month ? Then the dividend I am getting now will be less by 10% Is my understanding ok.? Dear GHANSHAM ..Yes, if you do so, all the LTCG are tax-exempt for you. But, kindly do not take decision just based on taxation viewpoint. Q: What about NRIs who have investments in MF schemes? Is this 10% tax payable by NRI’s as well ? Also, TDS is payable by NRIs on MF investments. Don’t you think investors will now shift towards ULIPs since it is still tax free? It seems 10% LTCG on equity shares and Mutual funds investments has resulted in bringing ULIPs on par with Mutual Funds. (based on returns). Cost structure wise, new ULIPs are competitive with Mutual Funds anyway. The important assumption is time horizon is 15 years and above. I believe this 10% LTCG would cost more than 10% in reality since benefit of indexation is denied and STT stays as well!!! We can see more and more people flock towards ULIPs. Only the time will tell. I agree that new-age/online ULIPs are cost-effective. But, don’t you think Direct Plans of MFs match them in cost perspective? I still believe that Term plan with adequate cover + investments in Mutual Funds makes a compelling story to buy than investing in ULIPs. I agree with you that Mutual funds still have an edge over ULIPs. However, we are living in a country where not even 4% of the population is investing via Mutual Funds route. This is bound to be since almost 2/3 of population is financially illiterate to understand complexity of stock investing. Let’s not forget that the underlying Securities for ULIPs are Equity/Debt investments, which are also part of Mutual Funds. Agree with you that its just the mind-set that needs to be changed, as investors feel more bonded to ULIPs than to mutual funds. But that is the challenge in-front of us (people like you and me)..we need to spread the knowledge about the pros and cons of all types of popular investments. Let the investor take informed decision! Thanks for sharing your insights,as always! Dear Surya ..It depends on when the units/shares are bought. You may give more details for the said scenario! which Mutual fund would u recommend for generating monthly income/ dividend for a senior citizen. As of now, DDT is not payable by AMC/unit-holder. Kindly go through this article on the mentioned topic.. Thanks for timely and well detailed article as usual. 1. It means each AMC has to deduct tax at source. 2. In case of Shares who will deduct the tax at source, the DP or someone else? 3. If it is TDS, it may give rise to problems in case there is miscalculation on the part of AMC which cannot be ruled out. Your view is that it has to be collected and declared by assessee while filing returns. Based on the available information with me, TDS is not applicable on sale of mutual funds. AMCs/DPs will not deduct TDS. It is the investor who has to calculate the LTCG/STCG and file tax returns accordingly. … a follow on question: is a capital gain realized in a MF swap – which would be an easy way to ‘bed and breakfast’ the investment to take advantage of the 1 lakh allowance. Dear Andy..I dint get your query. Kindly re-phrase it! if I redeem MF (for cash) then a capital gain is realized, but in any year 1 lakh of gain is tax exempt. I could re-invest the entire corpus in another MF… and repeat every year thus getting maximum LTCG exemption. My question is: instead of redemption for cash can I just execute a swap into a different fund with the same MF company (most offer this option). To put it another way: is a capital gain realized on a swap? The swapping or switching between or among the funds also attract tax implications. OK thanks – so that is something that can be taken advantage of to realize LTCG e.g. anuualy to use the exemption. It is also something to watch out for if you just want to swap funds. Dear AndyD ..Yes, your understanding is correct! I have one question. I am investing 35k per month in different equity linked mf from April 2016. Now my gain is about 1 lakh. Suppose I keep on investing for next 20 years. And maybe valuation would be around 5 crore and in investments around 84 lakh. In that case if I reedem all unit in that FY then do I need to pay tax on ( 5 crore-84 lakh) – 1 lakh ..10 %of this amount. Your gains till 31st january are exempt. Now from 1st february , you invest 35k for 20 years , your total investments would be 84 lakh and suppose final valuation is 5 crore , your gains would be 5 crore – 84 lakh . 1 lakh will be exempted and rest you have to pay tax @10.4%. You got it right but who knows what happens in subsequent years. May be LTCG would increase to 20% or removed totally again ! (1) How an AMC will calculate my LTCG tax if I have investment with another AMC.? My gain in ICICI Pru Value Discovery fund is Rs.80000/- and the gain from HDFC Equity fund is Rs.70000/-. Suppose I redeem ICICI Pru Value Discovery in December 2018 and HDFC Equity fund in February 2019, how HDFC will come to know that I am liable to pay Rs.5000 as LTCG.? Hereafter all redemptions (after 365 days) will be charged with 10% LTCG and then we will have to file the IT claim.? (2) What about NRIs who never filed IT returns but investments in MF schemes.? 1) It has nothing to do with AmCs. It is you who have to calculate gains from all sources and file returns accordingly. Do note that AMCs and exchanges share transaction details with tax department so it is advised to properly calculate gains and file returns ! Last year as quoted by the FM in his speech, the profit from equities were 3 lakh crores. I think it is not appropriate to leave this income tax free. Even though anyone will be happier without this, I think we should understand this and take it with a pinch of salt. We all knew it was coming. Equity investments have always given the best returns over any debt options and I think it will continue to remain so even with this 10% tax. When we appreciate the govt when it provides a universal healthcare programme for example, we should know that the money will come in from routes like these only. I will continue to invest in equities just like the way I continue to invest in FDs after the interest rates have come down. I think salaried class can get more benefits if more ppl start paying their due taxes. They should exempt investments in ELSS from LTCGs !! That will be beneficial for small investors or they should increase exemption limit to 2 lakhs per year ! Rest is fine ! And if they remove LTCG tax in future , then current rule has no effect on my interest generated. Is it correct ? Let’s invest (if any) based on the current scenario..
Then he not need to pay any tax incliding LTCG tax. Is it right ? If a guy buy has business income of Rs 200000 and income from equity 200000, Then his net income is 400000. Tax = 5% of 150000 . Correct ? 1 – Very good question! I believe that Basic Exemption Limit Rs 2.5 Lakh will be first applied towards Section 112 A LTCG ie (Shares/Equity mutual funds). So, the tax liability would be NIL. (However, we need to re-check this with a CA). 2 – In this case, if gains are LTCG then Rs 1 Lakh is tax-exempt, then basic exemption limit is applied for the remaining Rs 1 Lakh (gains) and the rest of income, the remaining taxable income will be charged to taxes at applicable rate. I think you should carefully consider the return in an year and withdraw the units which will amount to no more than 1 Lakh in an year. You can then immediately rebuy at lumpsum. This will ensure that you lock your profits upto 1 Lakh. Otherwise, lets say you withdraw your investment after 3 years with say 2 lakhs, you will still be taxed for 1 Lakh. So plan for 1 lakh profit withdrawal every financial year. Dear Yashwanth ..Thank you and keep visiting! ” the highest price quoted on 31st January, 2018″ is there any mechanism to keep the track of this. “only if all such extra gains are above Rs 1 lakh.” I assume that this is per script and not for the year. Dear Gopalakrishnann ..I believe that it is not on scrip level basis. It is for the year Sir not script wise. Thank you for simplifying LTCG . Life goes on…..if one were to invest in MF’s going further, (long term)given the current scenario which category would you recommend now …Balanced funds? Also considering the way mid and small caps have dropped should one stay stay put in this MF category from a long term point of view. Are you foreseeing a probability of balanced/hybrid funds increasing the debt % ? Awaiting your MF picks for 2018/19. total exemption from paying LTCG TAX? any time limit is there? As you have purchased the shares prior to 01-02-2018, all LTCG accrued till 31-03-2018 are tax-free for you. The cost of acquisition on these shares is the last trading price quoted on stock exchanges as on 31-01-2018. To claim total exemption on these, you may have to sell before 31-03-2018. For STCG, taxes have to be paid @ 15%. As always, a perfect article to read after the shock our own Finance minister has given us yesterday. MY only thought is, if my investment is yielding me 1 crore after 20 years, I would have to pay flat 10% on 1 crore -1 lac, which would be approx 10 lac, considering all your investments have completed 1 year. This sounds too much to be honest for now, but I guess we should still be positive about this and keep investing in equity because this is the only instrument which can make our dreams come true, obviously with a pinch of salt after yesterday’s budget. “Pinch of salt”, yes, well said! The end of day (as on 31-01-2018) NAV of the respective schemes is the FMVs. We can get the NAV details of the schemes in most of the finance portals. thanks for prompt reply,normally AMC gives capital gain statement,i think that should be enough,at the same time they give disclosure that investor should consult their lawyer.but what about equity share. Dear Yashpal.. Advisable to check the closing prices of respective shares as on 31-Jan-2018 and keep them for for future reference. Advisable to keep the closing day Stock prices/NAVs of the invested funds for future reference, and these are easily available on finance portals. Hi Saurabh, Thanks for the informative article. I have a query about my understanding on how can i still save taxes from sale of MF. Suppose i have equity mf investments that i have done one year ago (eligible for LTCG). Return of these investments is 50000, If i sell these one year old units and then the realized gain would be 50K only. If I again purchase these units, then this would be considered as fresh investment. So, if every year, i sale my old investments whose returns less than 1 lac and re-purchase them again then do you think that we can still save taxes. Kindly do not invest in Equities keeping Taxation only in view. Sree, i agree from your point of view. But there is no harm is saving tax in any form of investment that we choose. But my point is ‘tax-saving’ feature should not the sole factor to select an investment option. As, these can change anytime! selling within 1 year, doesn’t it attract STCG 15% tax in this case?? Dear shylaja ..Yes, STCG tax @ 15% is levied. I understand that we should not be investing on SIPs only keeping in mind that the funds are tax free but other major reasons is that they give higher returns than the traditional government funds like PPF etc. But it is definitely little heartbreaking to digest the 10% tax. I had read your article but still i hve my doubts on the tax. Say after 10 yrs my investment returns are at 15% for a montly investment of 10000 and if tax is 10% how much i should pay as tax? Let’s think beyond TAXES when investing! Assuming SIPs are started from now, the accumulation can be Rs 27.50 Lakh in 10 years. If you redeem the entire corpus in a FY, then Rs 1 Lakh is tax free. 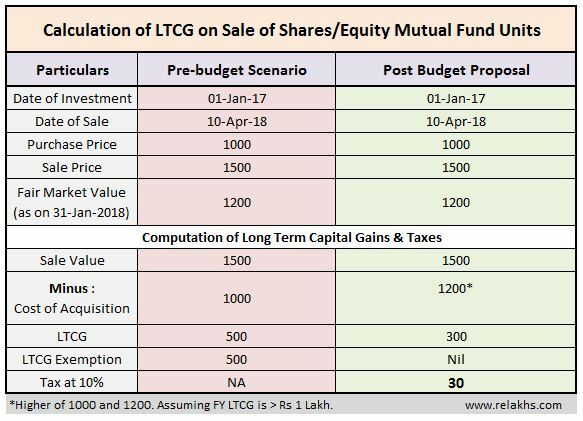 Remaining capital gains (assuming all are under LTCG), then your total investment cost – remaining capital gains is subject to taxes @ 10%. Does this mean that the ELSS funds are also taxable now? Dear Gowthami ..Yes, ELSS funds being Equity oriented funds, this proposal is applicable for ELSS schemes as well. Does this also apply to equity option in NPS? NPS has its own set of taxation rules. 1. Is it generally considered a Capital gain post redemption of a fund/share or even if I stay invested without redeeming, the accumulated gain will anyway be taxed? 2. With about 70 Lacs of my savings being planned for Equity investment for the next 3 yrs, I was hoping to reap the returns from the Equity MFs ie redeem the “gain portion” say after 3 years (year by year).. but now with this taxation, it now seems to me that redemption may afterall be a bad idea as am sure the Gain would be atleast 10% year on year and I do not think its a good idea to pay close to a Lakh on taxes on equity MFs each year! So is it better to stay invested and not redeem any appreciated value beyond 1 Lac at all or should I come out of the investments now itself and park funds in say Fixed deposits or other safer schemes (perhaps in my parents’ name as they are senior & non-tax paying). What would you recommend sir? 1 – It is applicable only on redemption. 2 – Kindly note that the Tax is on Capital gains made and not on the investment amount. The type of product choice is totally dependent on your investment objective(s) and investment time-frame. Sure. The taxation is definitely a put off but I see sense in what you meant overall when there is no other better investment option. 1. And when you say 1 Lac Long term gain is exempt – If we redeem 1 Lac worth units (which have crossed 365 days) in one financial year, we do not pay any tax on it right? If that is the case, I would redeem upto 1 Lac of gain in 12 months each year and use that for my monthly expenses, while the savings from my salary will be invested in Liquid funds. is this a good approach? 2. 50% of my savings/corpus have been earmarked for Equity MF investment and I will continue doing this investment for the next 3 years; 40% of my savings are going to go towards buying a house. These are my only goals/investment objectives. 3. And at this point I also wanted to pont that I am thinking of using the remaining 10% of my savings to buy FDs in my mother’s name (she is a sr.citizen with no income). So this portion is both safe and atleast this investment’s return portion will be tax free. Do you think I am right in planning so? 1 & 2 – I prefer to stay invested based on my goals,and will not redeem (if not required) just to save some 10% taxes. So, it depends on one’s investment objectives and goals. From the time of the budget I had been noticing that there’s a downward trend in the MFs and some of my invested funds such as ABSL Balanced 95 Fund, ABSL Equity Fund, L&T India Prudence Fund, L&T Emerging Businesses Fund and Kotak Select Focus have plummeted in value like anything. Currently the above funds of mine are making losses and the depreciating in NAV. Shouldo I momentorily stop investing in these funds until it picks up in value? the question is because I have defined monthly STPs to these funds. You have invested in a good set of funds. Kindly do not worry about the short term volatality of equity markets. The equity markets returns will not be ‘linear’. We need to be prepared for the volatility. Kindly have a good Asset allocation (invest in equity and debt securities/products) and try to re-balance (if required) your portfolio. Given a choice, I will invest additional investments when my funds’ NAVs drop. Suggest you to continue with your investments in Equity oriented products. Considering your time-horizon and profile, equity products are the best choice to generate decent inflation and tax adjusted returns. Definitely it will hamper fund flow in equity MF , particularly im ELSS category. Firstly government reduced interest rates in Banks and now seeing increasing liquidity via MF route , it is trying to put a check on already ballooned market. This step will stop frequent buying and selling in stock. But, its heartbreaking for new and retail investors. Dear Anup..Thank you for sharing your views! Kindly do not take investment decisions (sell/buy/hold) based on just taxation. If you believe that share has a great potential to generate returns, kindly continue holding it! Read the article again.. i have lot of queries, and doubts. I agree with you that selling of the sctript should be based on the requiremnt /needs. so,, for sure will not sell it till need arises. Thanks for the advise. Was trying to undertsand that if i sell the script and buy it again n some other stock, will it help? How much would be the tax component ( Rs. 1500 to 10 lakh in 17 years) . Is there any upper time limit of holding any script? We are always struggling with “WHAT -IF ” and “what if not” scenarios.. Selling and buying will not rule out the tax implications (be it be STCG/LTCG). Great informational article about recent LTCG. Yes, I think that the inflows will be majorly affected due to this because when we invest in equity (shares or Mfs) we also need to take risk. We take this risk only due to the benefit we get as a tax free income. After this LTCG rule, I think Mfs or equity will not be much attractive for those who are planning to make big corpus for their future goals (such as child marriage, retirement, etc). I see PPF as a good option instead. But do you think looking at prevailing interest rates and inflation rate (for next decade or so), is it possible to achieve desired corpus by investing in Debt only products? Can they generate positive real rate of return? I agree that debt products cannot generate the required returns, but whats the guarantee that one does not make the losses in the market. Investing in equities can be very tricky for bit conservative investors and if not planned well there are many risks involved when you actually need the money after long period. Investing in mfs is although good and safe for old investors but for new investors who are getting attracted regularly, it may be difficult to invest further. That is the risk-return reward one gets by investing in Equity oriented products. Risk remains the same for old or new investors. However, one (old or new investors) can/should take advise from trusted Advisors (preferably from fee-only advisors, if required.